News outlets have publicized the increasing rates of autism over the last few years, with recent data suggesting about 1 out of every 100 children is on the autism spectrum. A new University of Wisconsin study within state schools suggest those rates may be stabilizing; since increases seen in the number of students in autism special education programs were limited to schools that had very few autistic students when the study began in 2002 (data was collected through 2008). Schools that started with 1 percent or more of its students in autism special education programs saw little or no change in enrollment when the data collection finished. While people who commented on the findings didn’t offer any conclusions on the future of autism diagnoses, one autism expert not involved in the study theorized that variance across schools is decreasing because autism detection has improved, even though not all students enrolled in autism special education programs may actually be on the spectrum. Unfortunately, I don’t see this study affecting the discussion heavily. The mentality of most people affected by a disability or disease is their own well-being. That’s not to say selfishness runs rampant, people simply don’t worry about other issues that aren’t directly affecting them. Most readers I know who visit this site live in the neighboring state of Minnesota, where it’s not known if a similar pattern to the Wisconsin study exists. Also, because the study focused on the frequency of autism diagnoses and not any potential causes, readers might shove this story aside. Studies in general aren’t too compelling since the juicy parts lie in the numbers and not necessarily the emotional aspect of the disorder. Finding that tell us rates may be stabilizing in one state doesn’t get us much farther in the information cycle, since many who follow the autism spectrum likely have noticed the increase in diagnoses and accuracy. The Wisconsin study simply confirms what may have been anecdotal suspicions, but it could serve a cue to other states to see if the Badger state is an outlier or a precursor to autism across the country. 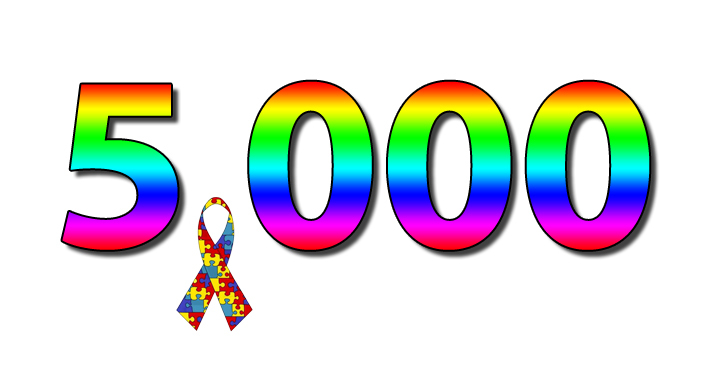 Autism news has been a little slow lately, but there’s still plenty of you interested in my previous posts based on the number of visits in the last few weeks, making today a milestone moment in the history of this blog. The Autistic Journalist recorded its 5,000th hit today, less than a year after I toasted the 1,000th hit of this site. While my employment status is struggling, I find the slow but increasing growth of this site encouraging. I don’t have any original material to contribute to honor this occasion, but I can offer some insight from Fox News via Reuters (don’t worry you politicians/pundits, lol) reporting on findings published by British scientists suggesting a 15-minute brain scan could be used in the future to detect autism. The results came from testing 40 adults, half with autism and the other half not on the spectrum, and boasted an accuracy rating above 90% in detecting the condition. Using standard MRI machines, they analyzed structural changes in the brain’s gray matter. Scientists are hoping tests on children will produce similar results. Obviously, the small sample size compromises this study to an extent. While intriguing, others may want a more expansive study to reduce margin of error. However, this marks the third story I’ve noted this year reporting on potential methods of discovering autism in the future. I discussed the cons of current testing before, requiring the need for a more objective supplement. Reuters also believes more education is needed, as they use a couple paragraphs to reiterate what autism is and the frequency level in the United States and Great Britain, where most autism cases and research appears. However, with media coverage continuing its shift to answering the questions they brought up in the last few years, the trend I’ve noticed regarding detection methods reveals two theories: an objective test for autism may be widespread within our lifetime, or the Internet is increasingly effective at spreading news not picked up by newspapers or traditional TV newscasts. Whatever the reason, I’ve analyzed too many stories to rule out new detection possibilities as a coincidence (urine test, speech recognition software, brain scan). The question will eventually transform to which test comes out first, and how many will be available to a culture of paranoia. Perhaps the best benefit out of this is the chance that people will finally stop inquiring about my thought process and focus on other topics within the autism spectrum.